We are a not-for-profit organization, funded and staffed by volunteers. 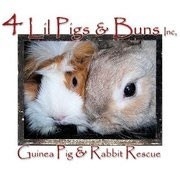 Rescue, rehabilitate, and re-home displaced and unwanted guinea pigs and rabbits. Educate the public on general and proper care of these animals, and offer general support through literature and counseling. On occasion, we are able to assist with ferrets, hamsters, gerbils, rats and mice. However, we have no actual shelter facility, and house our animals in various INDOOR-ONLY foster homes throughout Florida. Our volunteers and foster homes are spread out in various areas such as Ft. Myers, Sarasota, St. Petersburg, Tampa, and Orlando. is this still active? I know it says so in this page, but I sent an email and that direction is no longer in use, same as the website. I have two females that I need to find a home for. One is about 2 years old and the other a year. They are currently housed together and I really would like them to stay together. They would also come with their cage. It is a two story cage from Bluestone Commerce and very large! This is a WONDERFUL rescue! I have gotten 2 guinea pigs and 2 ferrets from them. They care so much about their animals and the homes they are going into! I am looking for a baby boar to pair with my boat Terra. i am looking for a male and female guinea pig we live in Bahamas so they would have to be shipped.